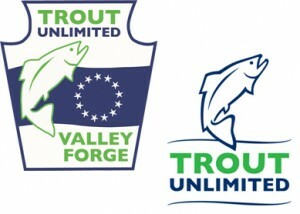 For more than forty years, we at Valley Forge Trout Unlimited have pursued better water and better environments for the cold water streams of northern Chester County. The original Valley Forge Trout Unlimited (VFTU) stream restoration project in 1979 was on two stretches of West Valley Creek. Stream straightening had left the stream channel with very poor habitat. Meanders were put back into the stream bed, various boulders and other devices were placed in the stream channel to provide cover. The stream now supports many more trout than previously. The project was included in “Better Trout Habitat” by Chris Hunter, wherein he surveyed stream restoration projects nationwide. The project earned a Fish Commission award in 1988 for stream restoration and improvement. 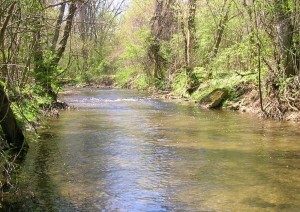 Valley Creek, which flows through Valley Forge National Historical Park, has an outstanding wild trout population, over three times that needed to make Class A designation, the state’s highest. However, poor stormwater management programs have caused some severe erosion points along the stream. Adopt a Stream projects to minimize erosion and featuring restoration and bank stabilization have been implemented. Valley Forge Trout Unlimited received PA Department of Environmental Resources grant funds in the amount of $5,000.00 to do stream improvement work on Valley Creek under five permits in 1995. All the permits were completed with expenditures for only materials and rental equipment. All labor to accomplish the bank stabilizations, deflectors and in stream structures was donated. Excess costs above the amount of the grant were borne by VFTU. These projects are still functioning well today. Paoli Car Yards: PCBs were washing into Valley Creek and ending up in dangerous concentrations in its fish’s flesh. This fact forced the removal of Valley Creek from the state’s stocking list and the stopping of taking trout from the stream. Neither state or federal authorities seemed interested in resolving the problem, since the source was the federally owned Paoli Car Yards, the previous Pennsylvania Railroad repair facility. After repeated frustrations, a lawsuit was filed, which turned out to be the first of over 400, resulting in declaration of it as a Superfund site and subsequent ongoing clean up. When a major office park development was planned, Crabby Creek was going to be dammed up, and a “Duck Pond” created. This would have eliminated its spawning habitat and released warm water downstream. Many meetings with the developer eventually led to no duck pond, a substantial green belt on both sides of the stream for stream protection, and very extensive channel restoration efforts (including relocation of marooned fish when a short section of the stream had to be relocated.) VFTU presented Trammell Crow with a plaque in gratitude for a job well done. Chapter representatives are still attending meetings in Delaware County, Chester County, and Montgomery County. We are continuing to attend township meetings and work towards the preservation of the Valley Creek watersheds in rapidly developing Chester County.